The management of a business needs to make sure that all the demands both of the operations and the customers are well supplied. It is essential for all the stakeholders to know the current situation and condition of the business, which is why proper work evaluation is needed to be implemented. In order for the business to do this, a work performance evaluation form is essential. There are various types of work evaluation forms that can be used depending on the aspect of work that will be evaluated. The workforce plays a vital role in assuring that all the things that are needed to achieve the objective of the business are properly implemented. This is the reason why work evaluation is applied in various industries. The usage of work evaluation forms varies on the field where the business belongs and the kind of work processes where employees are immersed in. In this article, we will discuss the importance of work evaluation, the most common information that you will find in a work evaluation or performance evaluation form, and the things to remember when conducting and creating a work evaluation form. These pieces of information are usually found in the header or at the top of the work evaluation form document. Aside from these items, it is important for everything related to the evaluation to be written and specified in an organized manner. Listed below are some of the basic content with regards the evaluation processes that should be seen in the specified document. 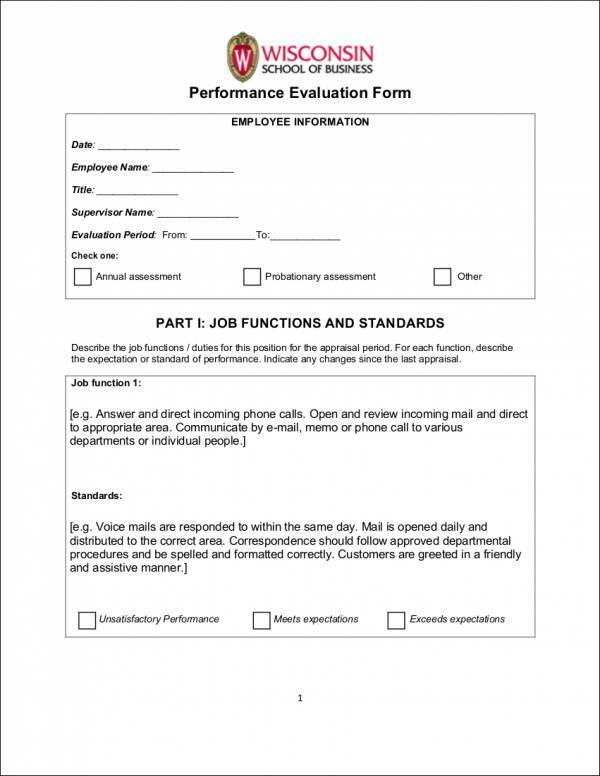 Since there are different industries where an employee can be a part of, it is important for businesses to take note that the content of their work evaluation form should be relevant to their improvement aspirations and the work description of the job functions that they would like employees to achieve on a daily basis. 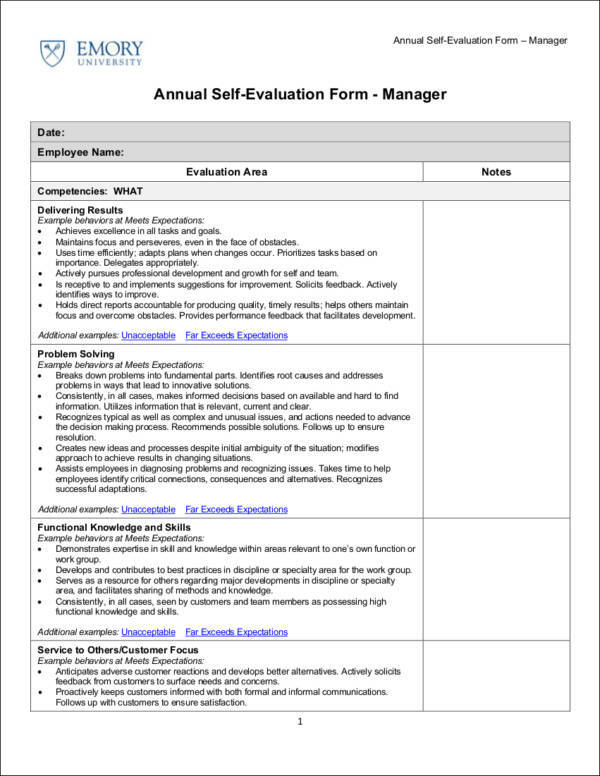 Work evaluation forms ensure that there is an objective procedure that is followed when identifying both the strengths and weaknesses of an employee when it comes to performing his/her tasks. Work evaluation forms serve as a documentation of the entire evaluation process, which can be used as references when there is already a need for the employee to either be regularized or promoted. 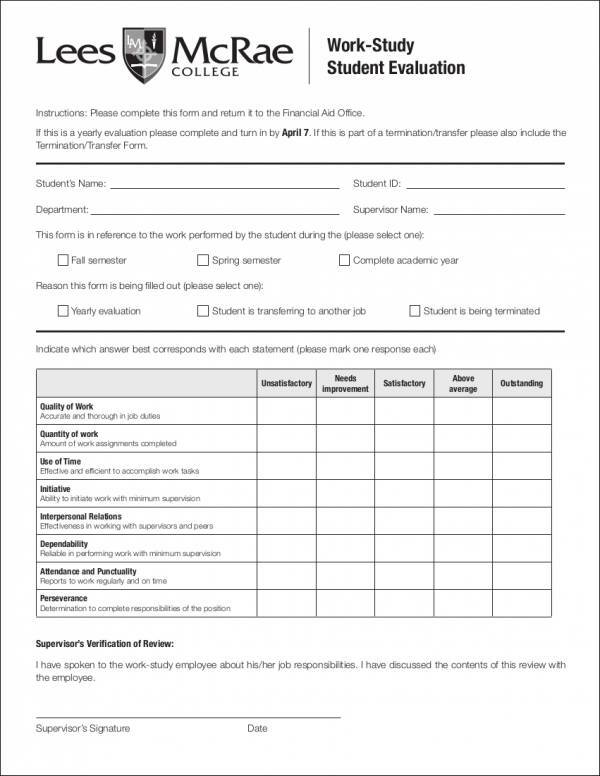 Work evaluation forms help the human resource department to be more organized when it comes to bookkeeping processes. The ability to take note the improvement of an employee can help the management to particularly assess whether the programs of the human resource for employee and work improvement are efficiently realized. 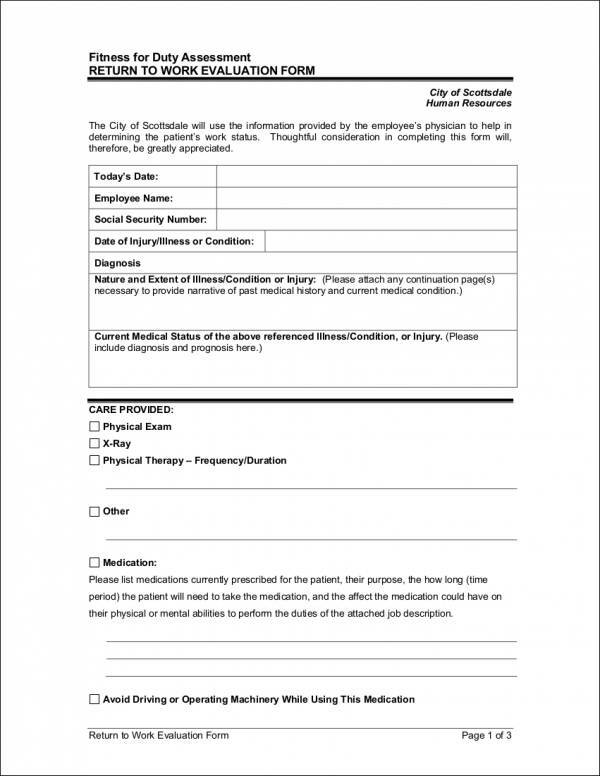 Work evaluation forms contain all the details of the evaluation. Having all the information present in one document will allow the employee, his/her immediate head, and the management have an easier time to pinpoint both the strong areas and weak points of the employee’s performance. Keep in mind that the details that can be shared by these entities may not be the same depending on the regulations being followed by the company in relation to the specified matter. Just as how the entire business works as a corporate venture, employees also play a vital part to create a significant difference in how consumers react to the offers and services of the business. As the ambassadors of the business, it is important for employees to be evaluated so that the management can ensure that they are effective in reflecting the brand that the company would like consumers to remember. Conducting work evaluation can serve as a professional process that can tell employees that they have rooms for improvement. This will help the employees to look forward to being better in their career. A work evaluation can identify whether an individual is fit for his/her job position or not. This will let the company know whether improvement plans are necessary to be given or if there is a need for the employee to be transferred to another department where his/her capabilities, skills, and talents can be fully utilized. Implementing work evaluation can help the management to reflect the improvement of the operations in terms of how the workforce provides excellence in the daily undertaking of the business. Hence, a work evaluation is not only important for the people but also to the entire company as it can showcase the development that has occurred in those that will soon be seen in the operations of the business. As previously mentioned, employers who conduct work performance evaluations on a regular basis can gain a lot of benefits from it. When conducting a work evaluation, there are certain steps that you need to do to ensure that the process will go smoothly, as well as achieve the right results. Step 1: First, create standards and outline the goals that you want to achieve. Before you conduct a work evaluation, it is important for you to establish a set of standards and goals to be able to systematically measure a particular employee’s performance. The goals that you will be creating may vary from employee to employee depending on their strengths and weaknesses. Step 2: Track the work performance of your employees. After you have established a system, you will now have to track the performance of each employee for a certain period of time, usually in a year. 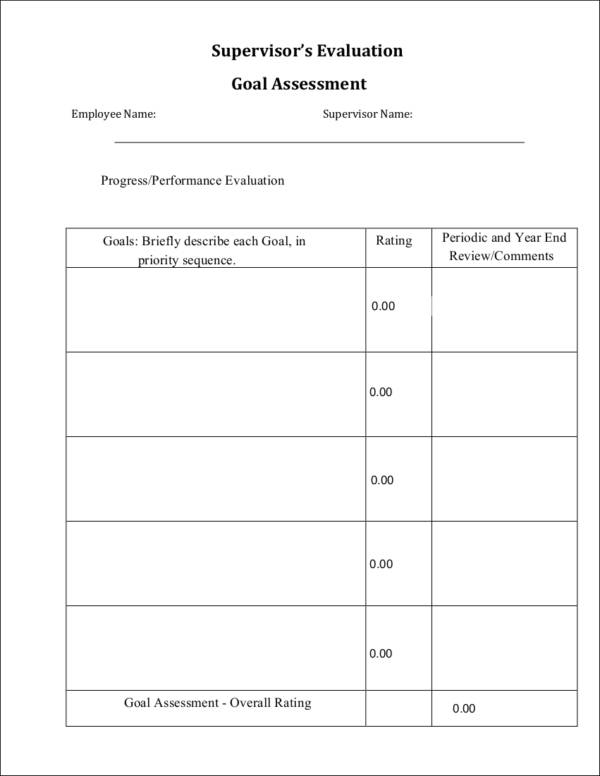 Keeping track of an employee’s performance, whether he/she has successfully completed a project/task, or fails on a task that he/she is working on. Step 3: Evaluate or assess the employee. 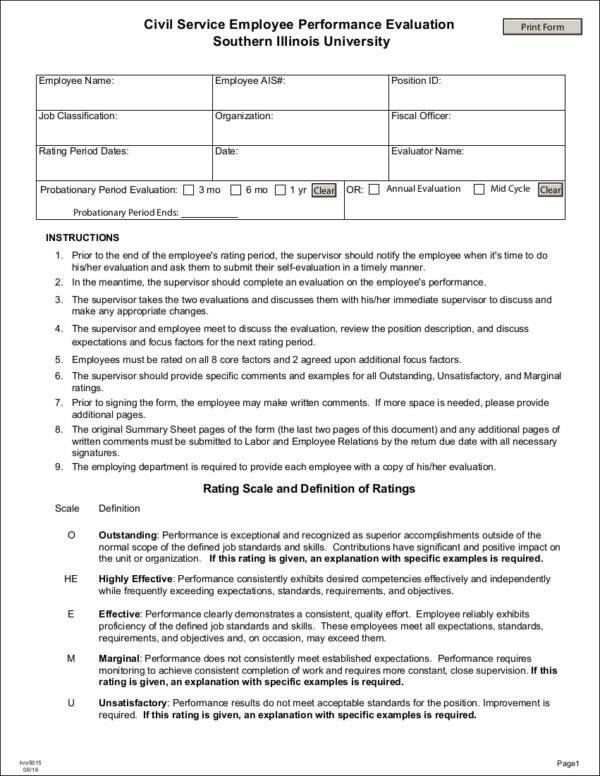 Now that you have a record or a log of the employee’s performance, you can start conducting an evaluation through a work evaluation form. Gather and review all the necessary documents that you will need to effectively evaluate the employee/s. Assess the employee’s performance, specifically in his/her productivity, and behavior. 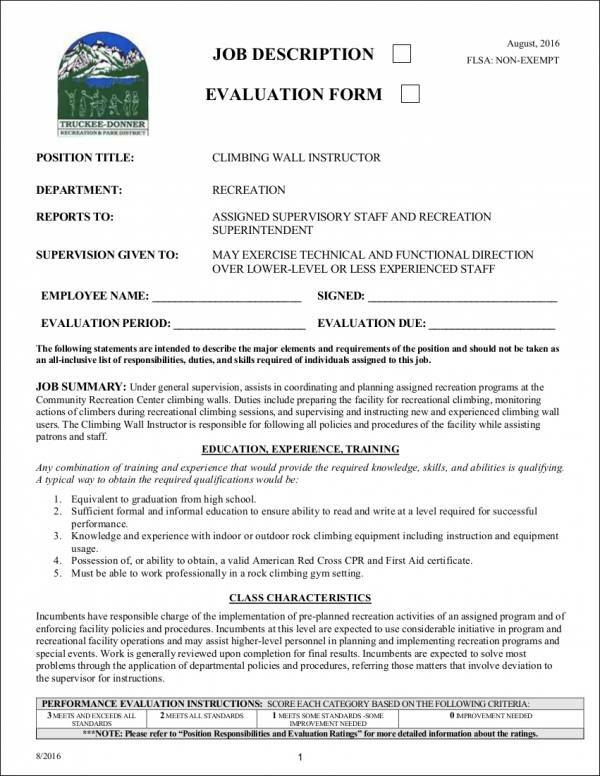 To conclude your evaluation, determine if the employee has met the goals and standards that you have previously set. Create a draft of the categories where you would like to assess an employee so you can easily put them in the layout of the template that you will use. Provide objective measures to help you identify the performance level of the employee. 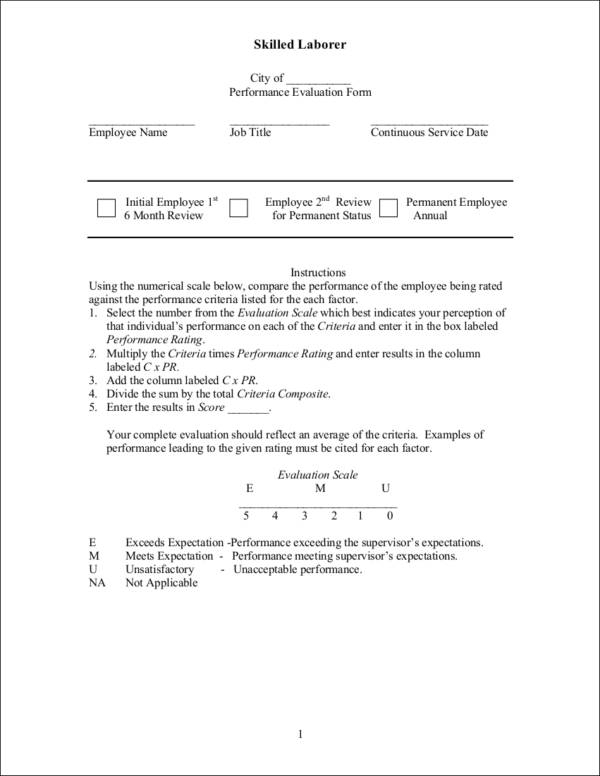 Always be organized in curating all the information that you will place in a work performance evaluation form. Be specific and precise when identifying the purpose of the evaluation so you can create metrics that are relevant and related to the activity that you would like to execute. Refer to templates of existing work evaluation forms but always edit its content depending on your needs. 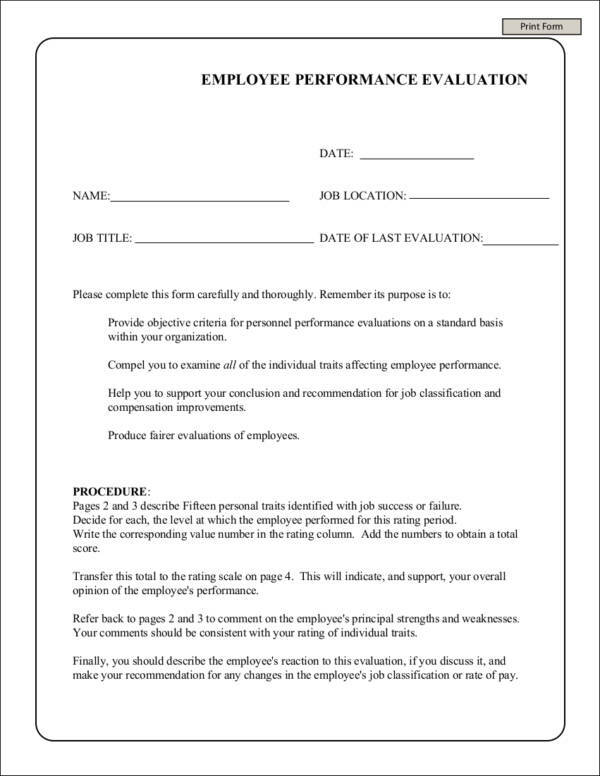 Using a work evaluation form can surely help in terms of making a work evaluation more professional, organized, and effective. More so, it can help not only the human resource department but also the other stakeholders of the business. When using this document, do not forget to be aware of the things that we have discussed so you can precisely allocate efforts and other relevant items that will be helpful for the maximum efficiency of the tool’s usage.